Paolo Carozza, professor of law at the University of Notre Dame, has been appointed the director of the University’s Kellogg Institute for International Studies. A specialist in comparative and international law with expertise in both Latin America and Europe, Carozza has wide experience with the complex interdisciplinary issues that Kellogg Institute scholars engage in their work. 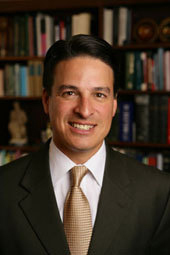 As a member and then president of the Inter-American Commission on Human Rights from 2006 to 2010, Carozza has also been extensively involved in the practical work of addressing the abuses of past political regimes and fostering the conditions for democratic governance throughout the hemisphere. At Notre Dame Law School, he founded and directed the innovative interdisciplinary Program on Law and Human Development, has served as the director of the Center for Civil and Human Rights, and directs the Doctor of Juridical Science program. In addition to his positions at the Law School and the Kellogg Institute, Carozza has also been a fellow of the Kroc Institute for International Peace Studies and the Nanovic Institute for European Studies. Carozza will begin his new position July 1. Originally published by Notre Dame News at newsinfo.nd.edu on May 29, 2012.